It is essential you understand your current your current natural Femme Figure – that means with NO padding or shapewear. You must measure these with a cloth / soft tape measure – and you must measure in the correct place. 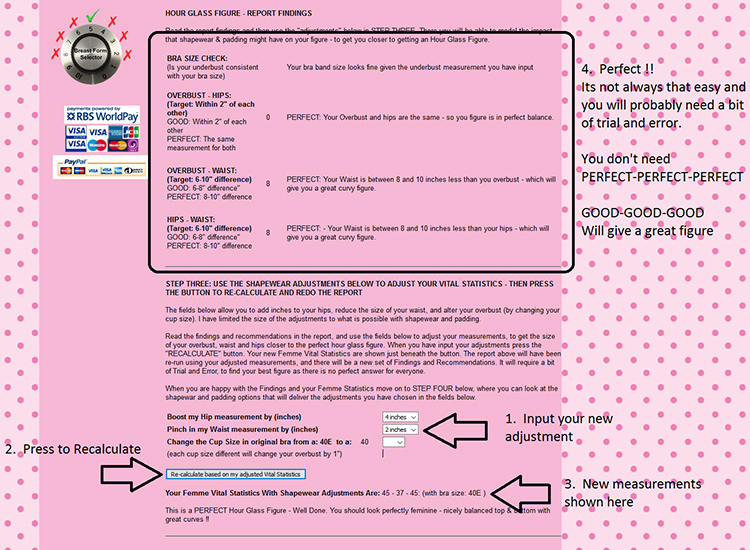 If you are not sure, please see my guide by CLICKING HERE. Please make sure you measure where and how it states in the guidelines – and use a cloth tape measure – its worth spending a few pennies to get it right. Just input them into the calculator as shown below. If you know your bra size then just use that size – if you need a bit of help getting a suitable bra size then go to the Bras & Breast Form size calculator by pressing the image at the left side of the website. Choose the sort of look you want from three basic options – listed in a dropdown menu. In this case I have chosen “Voluptuous”. Just PRESS the button “Calculate my Bra Size” – In this example, it has come up with a 40E bra size – so we will use that size in the rest of the example. Now you have all your measurements – you can finish by inputting your Femme Measurements and Bra Size into the calculator as shown below. To get the Calculator to compare your measurements to an “Hour Glass Figure” just PRESS the button marked “Compare My Measurements to an Hour Glass Figure”. Your Overbust and Femme Hips to be within 2″ of each other – this makes sure you are balanced top & bottom and will not look top or bottom heavy. Bra Check: this just makes sure that your bra size is consistent with the underbust measurement you inputted earlier. If it comes up with a warning – but you are happy with your bra size – then you can just ignore it. For my measurements it comes up as ok.
Overbust – Femme Hips. This checks the difference between your Overbust and your Femme Hips. If there is more than 2″ difference – it will put a “LOOK AT THIS” warning with some recommendations. The number displayed is the difference between the two. For my measurements this is 4″ and there is a “LOOK AT THIS” warning as my overbust is more than 2″ larger than my femme hips. Overbust – Femme Waist. 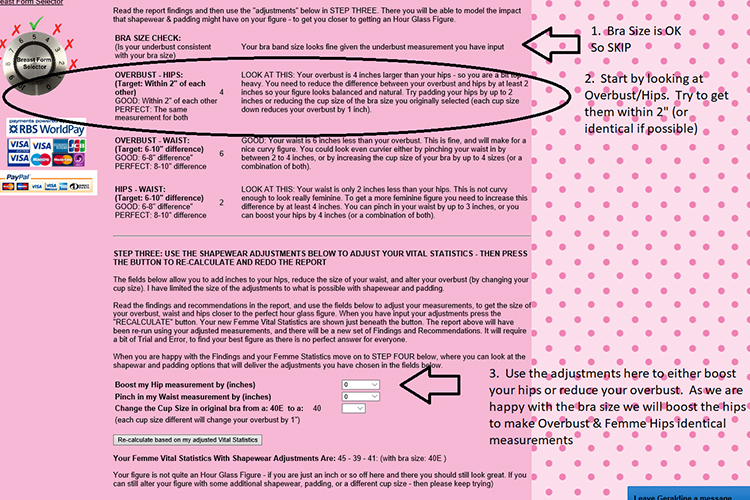 This checks the difference between your overbust and your femme waist, to see if it is between 6-10″. The number displayed is the difference between your two measurements. For my example measurements, the difference is 6″ – so this is marked as “GOOD” – as it is in the correct range. Femme Hips – Femme Waist. 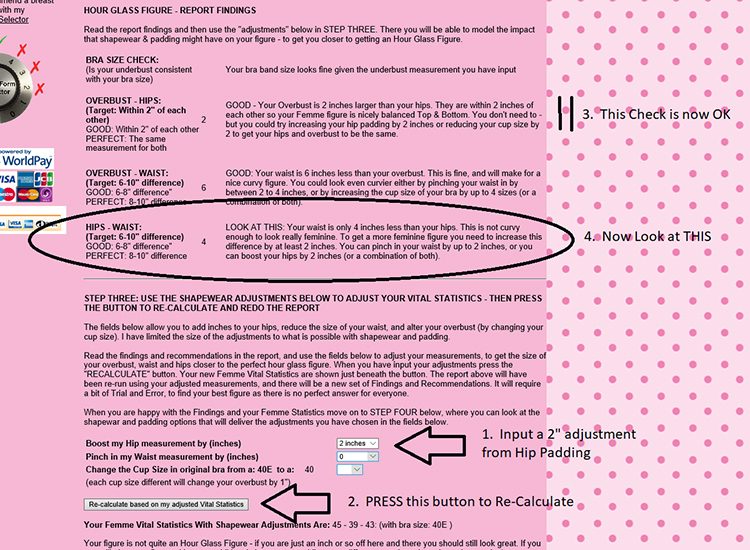 This checks the difference between your Femme Hips and Waist, to see if the difference is between 6-10″. The number displayed is the difference between your two measurements.. In my Example the difference is only 2″ so there is a “LOOK AT THIS” warning label. This will take a bit of trial and error – Adjusting your figure, and re-running the report – and so on – until you get as good a shape as you can get. I would ALWAYS recommend you start with the Overbust / Hips area – and that is exactly where I will start – looking at the Overbust / Femme Hips. IMPORTANT: If you can get your Overbust and Femme Hips to be exactly the same measurement that will give a “PERFECT” rating for this check. If you can use the adjustments to do this it will make the process faster (for the example I have not done this – so you can see how the calculator works). 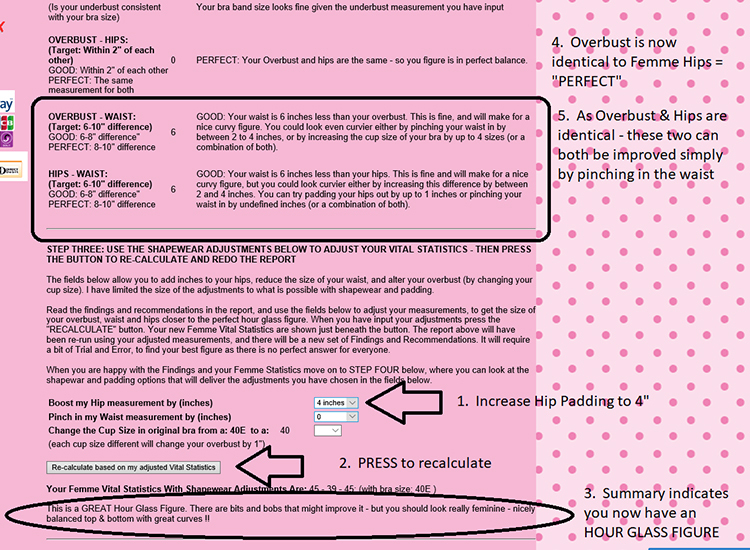 The report indicates that the overbust is 4″ larger than the femme hips. Ideally it should be a maximum of 2″ larger – or even better exactly the same measurement. So I need to either increase the hips or decrease the bra cup size – to try and get my overbust and femme hips to be with 2″ of each other (or a bit of both). In this example, as I am happy with the bra size – I have opted to increase the size of the hips by 2″. Use the dropdown near “Boost my Hips” to select 2″ and PRESS the button “Recalculate based on my adjusted Vital Statistics”. Your new Femme Vital Statistics are displayed just below the Button – and the Hour Glass Figure Report has been re-run using your new measurements (in this case with the Femme Hip of 43″ instead of 41″). Your original Vital Statistics are still shown further up the page. The new report is shown below. The new report has “GOOD” Ratings on Overbust/Hips and Overbust/Waist – so we now need to look at the next “LOOK AT THIS” area – which is Hips / Waist. With two GOOD ratings the figure is a already looking better. The Femme Waist is only 4″ smaller than the Femme Hips – so we need to either reduce the waist or increase the hips – to get a curvier looking figure. I can either pinch in the waist by 2″ OR add another 2″ of hip padding (or a bit of both). Which is why you will need a few cycles around. As you can see the ratings are now PERFECT-GOOD – GOOD, and you can see from the summary at the bottom of the page – the figure is now an HOUR GLASS FIGURE !!! You can stop here – or you can continue to play with the calculator to see if you can score more “PERFECTS”. PERFECT – PERFECT – PERFECT !!! It is not always possible to get this – it just depends a bit on your body shape, just try and get as close as you can. GOOD – GOOD – GOOD, or anything better – will give you a really natural, feminine looking figure – so please don’t worry. So we have started with Femme Measurements of 38-39-41 – and a bra size of 40E – this gave Femme Vital Statistics of 45-39-41 (with a choice of bra size which is “Voluptuous”). By adding 4″ of padding and 2″ of waist cinching – we get to Femme Vital Statistic of 45-37-45 – which is a voluptuous Hour Glass Figure !! balance top & Bottom – with great looking feminine curves. Simply purchase what you want – and enjoy your new figure ! !